I’m currently reading Today I Am Carey and am thoroughly enjoying it. Highly recommended (at least the first half of the book). Sadly, the Tim Powers is too short for a long cruise. Woohoo, new Doctorow! And I still have a fond place in my heart for both Poul Anderson and Gordon R. Dickson. Hey, Hillary Rettig! Are you the Hillary Rettig who wrote the story “Through Alien Eyes” published in Asimovs…well, a few years ago? The Municipalists, definitely. I am in the middle of Seth Dickinson’s The Monster Baru Cormorant (which has some significant things to say about predatory capitalism) and I love China Mieville’s Bas-Lag novels, where the city is a character as much as is the book’s protagonist, so this seems like something I will really like. I read a short story by Martin Shoemaker which probably got incorporated into Today I Am Carey, and I thought it was pretty good, so I plan to read the novel soon. The Municipalists, seeing as how I am a trained city administrator. 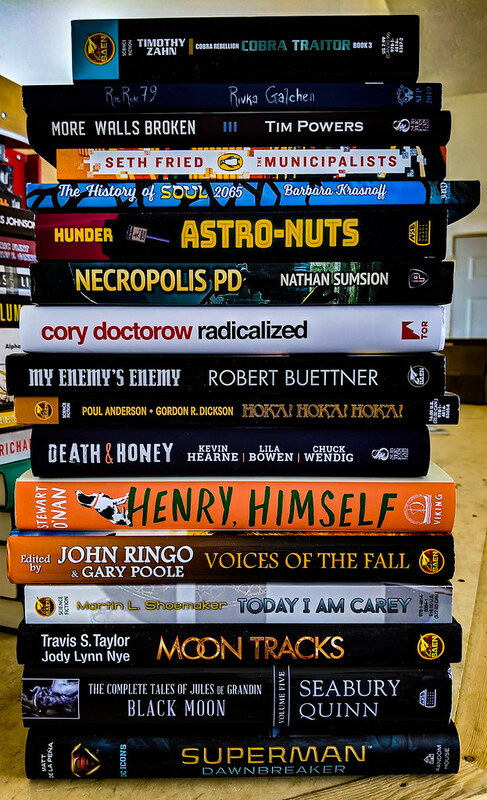 Love Tim Powers, and Cory Doctorow, but really, my big value from these pics of stacks of books is those by folks I’ve never heard of. Although I am a book fan. That Doctorow book seems interesting! Are there any BEES in that Death & Honey? Also, could you use your superpowers to get that fan-built Lego robot from your Twitter feed released as an actual Lego kit. I need that real bad. Tim Powers is always great, and I thought I had all the Seabury Quinn, but no. Have to look for those! These ARC pictures always raise my excitement about new books! I’m very happy to see new Doctorow and Powers books. Thanks also to those who mentioned that some books by authors I don’t know yet are good. Mmmm, new things to read. I’d take my first new foray on the Rivka Galchen book. A four-novella approach (which worked well in The End of All Things).